Too often we say nice things about a golf course because we don’t wish to offend anyone – particularly in Australia where we have a relatively small golfing sphere – when compared to the US and Europe. So it was with some trepidation I headed for a course already highly-rated by our so-called “experts”, all of whom must play off scratch and shoot par figures every time they go around. Kooindah Waters is just a short iron from the Wyong horse racing track and a quick search on Google reveals that ‘Kooindah’ is actually a word meaning ‘clear water’ so that means the name of the course is, well it’s actually ‘clear water waters’. Ah well, with water actually part of the landscape on at least 16 of the 18 holes, I guess they can call it what they like – as long as the word ‘water’ is in there somewhere. And after playing 18 holes there last month I challenge anyone to stay out of the water and still break their handicap. I played the round of my life but still had three penalty shots on the back nine, thanks to some watery ‘graves’. It also distresses me to read that some of these so-called resort courses are struggling in this day and age. 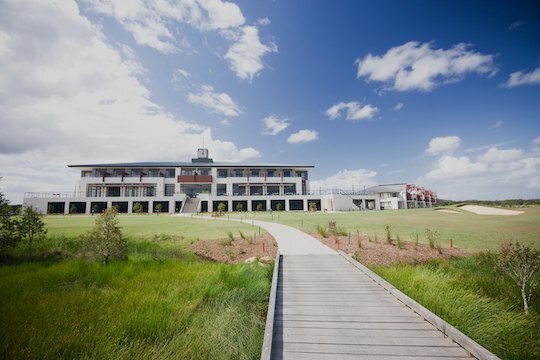 Because quite frankly Australia needs more courses like this and although they aren’t that cheap to play, they are an experience that makes shelling out a few dollars worth the trouble. Yes, Kooindah Waters is that good. Granted that unless I was a member I probably couldn’t afford to play there every week – much as I’d like to. But if you head for the west coast of the United States you aren’t going to whinge about the $500 they allegedly charge to play Pebble Beach and likewise if you are in Scotland you would be mad not to pay the £125 for Kingsbarns or £200 for The Old Course at St Andrews. Simply, you’d be kicking yourself if you went home and didn’t play these great courses. 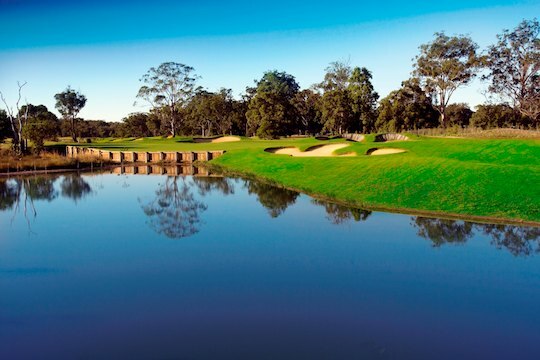 Granted Kooindah Waters might not be in the same street as those world golfing gems – but it is that far ahead of your average municipal course that we are all so used to that I really would urge you to go along and find out for yourself. The opening hole is a rather innocuous-looking par five of just 422-metres (from the gold plates). Still it doesn’t have an index of nine for nothing and our foursome found all sorts of trouble with water and swampland on both sides of the fairway. Ask a middle marker to hit a drive that MUST go straight and you can just about guarantee that it will be impossible. Despite rating ourselves as “fair” golfers, we walked off with three double bogeys and a triple, although I did have the idle “boast” that I three-putted for my “double”. Not the start we were all hoping for. The second hole is one of Kooindah’s best: a par-three measuring 134-metres but a real trap if you don’t take enough club OR hit a slice. There is water all the way to the green on the right-hand side. Four pars had everyone laughing and raving about the course by the time we stepped onto the third tee. Don’t worry, I won’t put you to sleep by walking you through all 18 holes – much as I’d love to. Yet the third hole, rated as the hardest on the Ross Watson-Craig Parry-designed layout is one of those memorable holes that you will be talking about over a beer that night. It’s a typical Ross Watson “masterpiece”. You’re not quite sure where to hit your tee shot and unless it’s right on the button, well, you’ll find water, of course. There is some on both sides of the fairway, although it’s not that visible from the tee. We had a tee shot left and one right and both finished up in trouble. But two good shots here and you will be putting for birdie and if you make three or four on this impressive par four you will remember it forever. One word of warning though, hit the ball too far here and you might find trouble off the tee as well. Just a warning shot over your bows as you pull out the driver and contemplate your next move. The eighth hole is one of those classic par fives where you stand over that third shot to the green and realise you need to know exactly how far you hit your wedges or nine iron or risk more trouble. With water in front of the green and to the right and trouble behind it, the only real bail-out area is left. And let’s face it, not many of us know how to hit it left, unless we ‘pull’ it, by mistake. The ninth is also a classic and a poor tee shot will force you to lay up with your second shot as well. Like the famous 18th at Royal Sydney, you just know that people are sitting in the clubhouse watching whether or not you can play – or make a goose of yourself. An extra club here might be advisable for your second shot, just to make sure you clear the water in front of the green. A par here and you’ll be champing at the bit to attack the back nine. And the back nine does appear to be a slightly easier start – pars five-four-three that are all decent possibilities for par. The 17th is certainly one of Kooindah’s feature holes and photographs so well that you might forget you’ll really need to be “on song” to par the difficult 18th, which I rated the hardest on the course. But let’s face it, if you aren’t hitting the ball well by then, you don’t have much chance of posting a decent score anyway. They do everything right at Kooindah and I’d suggest dropping into the spring bar for a local beer as well after your round. After 36 points, it never tasted so good. I look forward to returning to Kooindah Waters sooner rather than later. 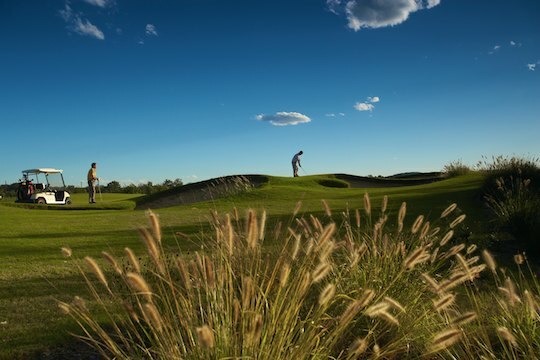 It is a golf course that makes you proud to boast Australian golf really is heading in the right direction. And we just need to show our support by getting out there for a game now and then. They tell me the accommodation there is first class as well. Sounds like that is the perfect excuse for a return visit. Soon!